The screen protectors ONLY compatible with Garmin forerunner 35. Do not bend the films and keep it away from children. Compatible with Garmin forerunner 30 / 35 / 230 / 235 / 630 / 645 / 735XT, Garmin vivomove HR, Garmin Approach S20. COMPATIBILITY: Screen protectors are for Garmin forerunner 35 ONLY. 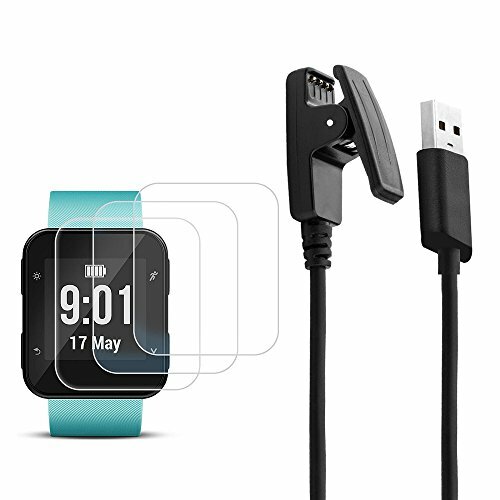 USB charging cable is made to the exact specification of smartwatch Garmin forerunner 30/35/230/235/630/645/735XT, vivomove HR, Approach S20. HIGH CHARGING SPEED: Just plug it into the USB port for convenient and quick charging, no matter on PC, Mac, Laptop, Computer, notebook or on Power bank. DATA TRANSFER: It can not only work as a charging cable, but also helps to transfer data fast and safely. 9H HARDNESS SCREEN PROTECTOR: Made of high hardness material, after tempered steel processing, the hardness of surface up to 9H, which provides daily protection to against scratches and reduce the damage of the screen. HIGH SENSITIVITY: The film is coated on the back with a strong silicone adhesive which makes it firmly attach to the screen and won't reduce the sensitivity of touching. If you have any questions about this product by AFUNTA, contact us by completing and submitting the form below. If you are looking for a specif part number, please include it with your message. A'O Watch Charger Station Compatible with Apple Watch Charging Dock,iWatch holder stand for smart watches series 38/42mm. Silver black color station, cable not included. Antislip Platform.